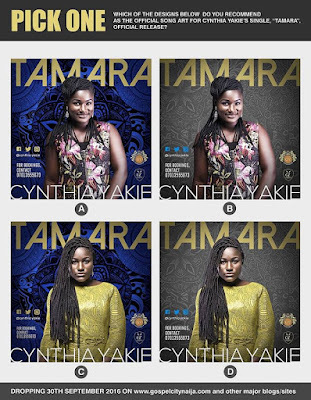 We are set to premier CYNTHIA YAKIE's Official single titled TAMARA on 30th September 2016. We need you to tell us which of the designs below is most suitable as the Song art for the song. Just drop your comment as A, B, C or D and maybe tell us why you Chose it. 10 people that suggest the art we eventually pick will win recharge cards and other goodies from Cynthia Yakie's record label, GY Empire in partnership with some of its partners.